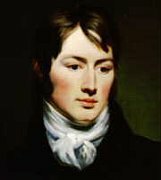 John Constable (11 June 1776 - 31 March 1837) was an English Romantic painter. Born in Suffolk, he is known principally for his landscape paintings of Dedham Vale, the area surrounding his home - now known as "Constable Country"- which he invested with an intensity of affection. "I should paint my own places best", he wrote to his friend John Fisher in 1821, "painting is but another word for feeling".